One of the decisions we had to make when we put Scout to sleep a month ago was what to do with his body afterward. In the past, we’ve buried our late companions — two cats, a rat, a rabbit, a budgie — in the backyard. But Scout was big enough — 50 pounds or so — that it seemed like it would be a real chore to dig a hole long and wide and deep enough for him. When the event came to pass, our vet told us we could have him cremated individually if we wanted. Afterward, we could scatter his ashes — the coffee-can scene from “The Big Lebowski” comes to mind — or stow him on the mantelpiece or have him interred at a pet cemetery, perhaps. Alternately, we could opt for a group cremation and have his remains buried — OK, I admit that the verb I think of is “dumped” — in a common grave somewhere. I forget what the price was for the different levels of service, but the group cremation/common grave scenario was much less expensive. With the feeling that the most important part of Scout was not his “remains” but our memories of him and the indelible mark he left on our lives, that’s the option we chose. After the wrenching experience of having The Dog put down, I didn’t dwell on where he’d wind up afterward. But last week, we got a card in the mail, a “certification of country burial,” from Bubbling Well Pet Memorial Park in Napa. Image of the area near the country burial site for animals handled by Bubbling Well Pet Memorial Park. The spot is in Solano County, east of Suisun City. Naturally, Kate and I decided we’d like to go and take a look at the pet memorial park — which sooner or later I’ll just call a pet cemetery. Kate had looked up the address and come up with a place on Atlas Peak Road, off Silverado Trail just northeast of Napa. That meant one thing to me: It was likely in an area burned in the terrible North Bay wildfires of last October. And sure enough, as we ascended the narrow road from the valley, we quickly encountered signs of fire — charred trees and shrubs, lots of construction activity as homes in the area are rebuilt. The pet cemetery was obvious — the Los Angeles Times described it last fall as “an oasis in a sea of destruction” — for the manicured lawns amid a landscape that’s both burned-over and turning summer gold. The memorial park is clearly in a state of rehabilitation, with evidence of heavy equipment having driven across parts of the property, a small heap of burned debris in a parking lot, and a collection of broken pet headstones — broken, I’m guessing, during the post-fire recovery — lined up on a wall. We showed up around 4 p.m. While there was plenty of traffic on the road adjacent to the cemetery, we were the only people there. No staff. No other visitors. It’s tempting to make light of it all, but I won’t. While my sentiments and beliefs may be different — when Kate and I talk about how we’d like to dispose of these bodies of ours when the only show in town is over, I think of sky burials or Walt Whitman — mostly, I’m impressed by how many people will go to such apparent lengths to remember these presences in their lives. When we got the Bubbling Wells card in the mail, I was thinking Scout’s “country burial” was in the Napa area. The picture on the card looks sort of like the lowlands south of the city. The difference between that image and the rugged hillside location where the cemetery sits didn’t compute at first. 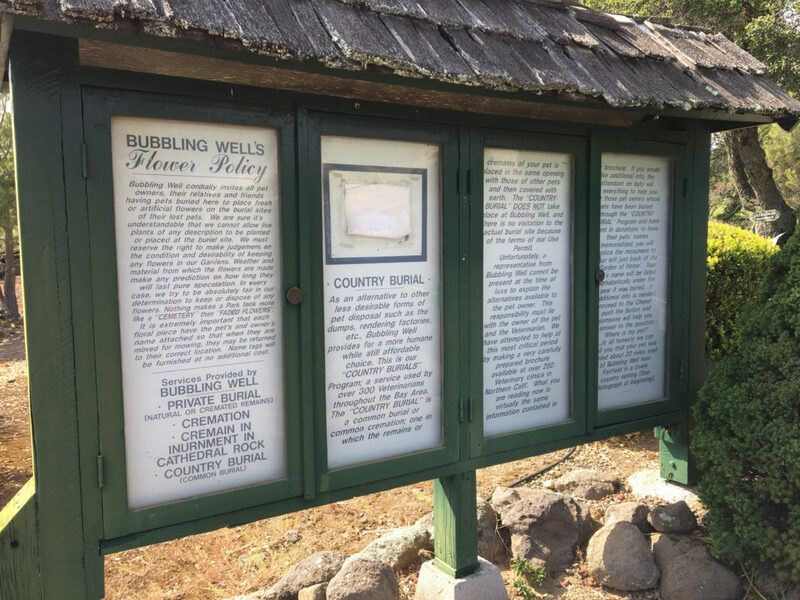 But as we ambled through the property, we came across a sign devoted mostly to explaining what country burials are, where they happen and that you can’t visit the burial site because of the conditions of a land-use permit. Of course, inquiring minds want to know just where this burial site is. A sign at Bubbling Well Pet Memorial Park explains the cemetery’s country burials. After a diligent hour or two of searching public records, that description appears to be more or less accurate. 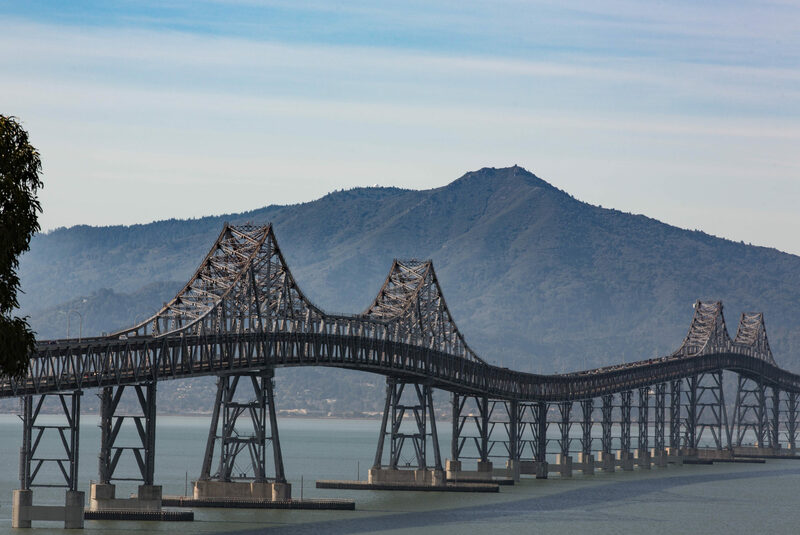 The site is a little southeast of Fairfield, south of Travis Air Force Base and just north of a range of low hills and, beyond them, the sloughs and wetlands associated with Suisun Bay. Is it a lovely country setting? This slice of eastern Solano County is one of the many parts of the greater Bay Area where one can look past all we’ve done to the place and get a glimpse of the intoxicating beauty of California Before Us. That picture on the Bubbling Well card, with the green hills and splash of wildflower gold? It shows the actual place where pet cremains are buried — nearly a cubic yard of them a day on average, coming from hundreds of veterinary and other facilities around the Bay Area. What the picture doesn’t show is the nearby highway, the trucks going back and forth to the county landfill, or the jets coming in and out of Travis; but framing is everything. How do I feel about Scout’s ashes being out there? It’s hard to say. But he did love every minute he spent outdoors, and I suppose for me there’s a little bit of resolution for me in that. An infant’s grave at the Bubbling Well Pet Memorial Park. That set off some more diligent searching. 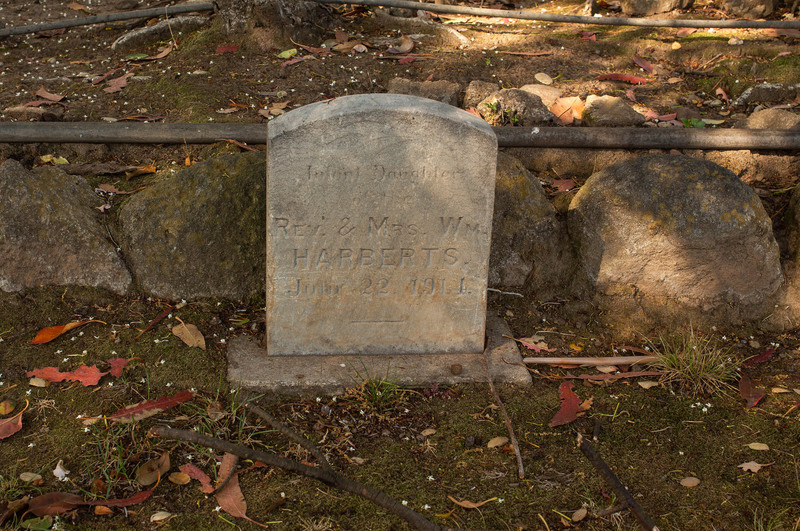 From the history I can find, the Harberts bought the Bubbling Well property in 1961 — long after the date on the headstone. The history also suggests that the Harberts lived in Iowa or Wisconsin, not California, in 1914. They did come west in the late 1930s and lived in the Los Angeles suburb of Glendale, where William Harberts, a Presbyterian minister, was a pastor. (Lydia died in Alameda in 1960; William died in Berkeley in 1970; one of their sons, Paul, ran Harberts Sporting Goods here and was a member of the East Bay Regional Park board). William and Lydia Harberts’s oldest surviving child, John Calvin Harbert, was born in 1915, and it was he who bought the Bubbling Well property and started the pet memorial park in 1971. It’s not clear to me why his infant sister’s headstone — and, one assumes, remains — are interred here. My guess is that the family didn’t want to leave her behind in some far-away Midwestern cemetery and brought her to Napa for reburial. A couple of other finds regarding Bubbling Well. It’s actually the centerpiece of a fairly important piece of American documentary film history: Error Morris’s first film, “Gates of Heaven.” Roger Ebert called it one of the 10 best films ever made (surprisingly, no, I have never seen it. We can stream it now, and having been up there, we will). Cal Harberts also got some press back in the late ’70s and early ’80s for attempting to establish his pet memorial operation as a tax-exempt religious institution, The Bubbling Well Church of Universal Love. In July 1980, the Los Angeles Times profiled Harberts and his argument for tax-exempt status. 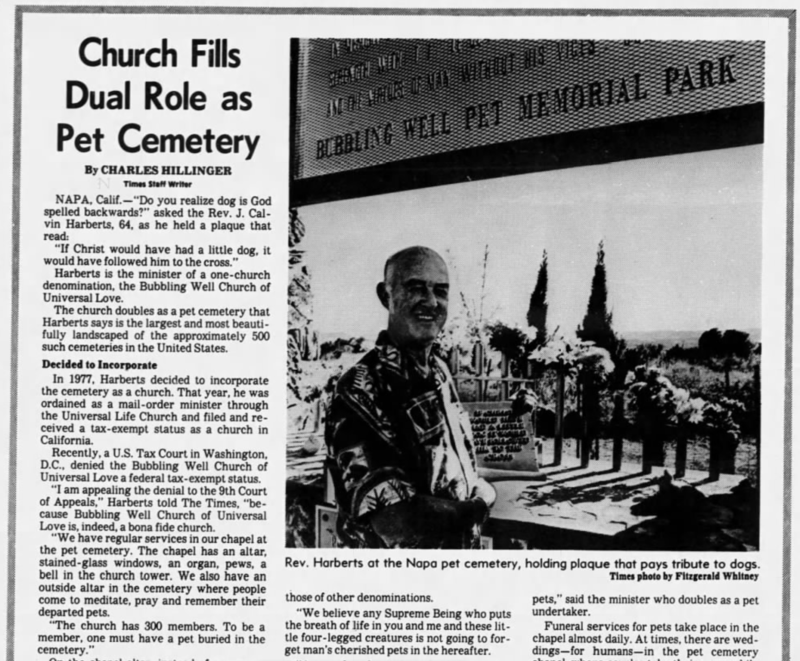 A 1980 profile of Bubbling Well Pet Memorial Park founder Cal Harberts. Federal tax authorities didn’t buy it. Thanks for the info on their Country Burial location. I was doing the exact same research which is how I came across your post. I assumed it was in that area as well. Tough to make a decision on what to do when given the options under those circumstances – I just went with whatever the vet thought was appropriate which is how we ended up with that burial. It’s not a bad way to go, especially given the alternative, which is essentially to send the pets to the landfill or rendering plant. That’s the way it was done in “the old days” and probably still is in many places.